Tag line: "Dare to Live"
The other night’s Academy Award ceremony certainly had its share of surprises (despite being nominated in 10 categories, David O. Russell’s American Hustle failed to capture a single Oscar), but when the winners for best actor, both lead and supporting, were announced, nobody so much as batted an eye. Based on a true story, Dallas Buyers Club features phenomenal performances by Matthew McConaughey (this year’s Best Actor) and Jared Leto (who took home the Supporting Actor Oscar) as two individuals infected with the AIDS virus who went to great lengths to bring some much-needed medicine into this country. The year is 1985. Ron Woodruff (McConaughey), a hard-drinking electrician who likes to hang out at the rodeo, has just been told he’s HIV positive, and has 30 days to live. At first, Ron refuses to believe the diagnosis, convinced that only homosexuals can contract the disease. But after doing some research, he learns even straight guys are susceptible (he himself got it from a drug-addicted prostitute). Refusing to take his illness lying down, Ron bribes an employee at a local hospital to supply him with AZT, the lone AIDS-related drug approved by the F.D.A. Unfortunately, Ron’s condition doesn’t improve, and when he’s unable to obtain any more AZT in this country, he heads south of the border to Mexico, where a doctor (Griffin Dunne) prescribes several medications (including the protein peptide D) that are not available in the U.S. Six months later, a much healthier Ron heads back to Texas with an idea. Teaming up with Rayon (Leto), an HIV-positive transgender woman he met in the hospital, Ron sets up the Dallas Buyers Club, an organization that, for $400 a month, provides medicine that AIDS patients can’t otherwise obtain in the United States. Despite the warnings of his doctor, Eve Saks (Jennifer Garner), and the constant harassment by the Food and Drug administration, both Ron and the Dallas Buyers Club flourish. But the question remains: how long will the Government allow him to continue? After a brief career in romantic comedies (How to Lose a Guy in 10 Days, The Wedding Planner), Matthew McConaughey has, in recent years, taken on more serious roles, and in 2012 wowed audiences with his searing portrayal of the title character in director Joe Nichols' 2010 drama, Mud. With Dallas Buyers Club, he continues to show how strong an actor he is, playing a guy who, illness aside, isn't particularly likable. 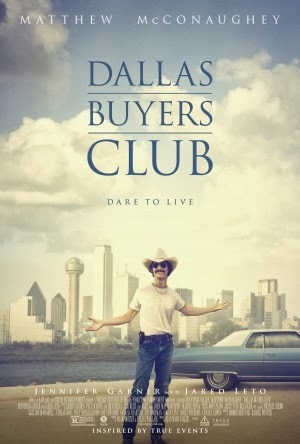 At the outset, Ron is a cocaine-addicted homophobe, refusing to visit an AIDS support group because of all the gays in attendance, and his initial motive for setting up the Dallas Buyers Club was to make a fast buck (regardless of how sick they were, those who couldn't pay the $400 dues were turned away). Even more impressive than his physical transformation (to appear appropriately emaciated, the actor lost 47 pounds), McConaughey pulls off the amazing feat of getting us to sympathize with a guy who under normal circumstances we wouldn’t give a damn about. Matching him every step of the way is Jared Leto, who disappears into the role of the troubled Rayon. A scene in which the character visits his estranged father (James DuMont) is poignant, but it’s the moments Rayon is on-screen with Ron that truly stand out (despite their extreme differences, the two eventually become friends). Dallas Buyers Club tackles a very serious subject, calling into question the practices of the U.S. Food and Drug Administration at a time when thousands of people needed them most. Thanks to the exceptional work of its two stars, the movie manages to get its point across, and in a big, big way. M.M BEST FILM SOO FAR.....AWESOME STUFF!